Computing, Digital Forensics & Cybersecurity held our first film screening last Wednesday. Zero Days was a great way to start, and the film, pizza and drinks were enjoyed by all in attendance. We have got another event coming up on Wednesday 15th March 2017 starting at 15:00. Students can vote for what they want the next film to be (see Blackboard!) and current front runners include The Social Network and Citizenfour. I’m voting for Citizenfour (I’ve seen The Social Network). I’m hoping no-one (ever!) votes for Skyfall which portrays Q as the worst cybersecurity expert ever when he plugs in a compromised machine to the MI6 network. Don’t even get me started on how realistic Swordfish is and always remember they only made one Matrix film! We look forward to seeing our students at the next event! This entry was posted in Events and tagged Film Event, Paul Stephens, Zero Days on February 21, 2017 by admin. 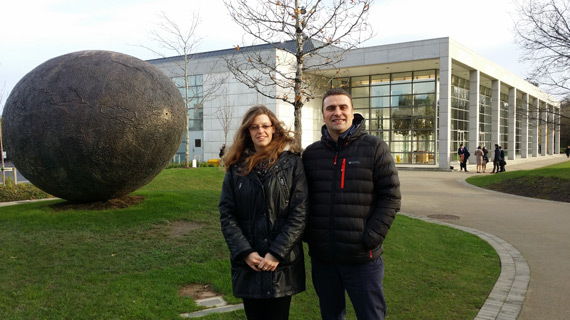 Dr Paul Stephens, Director of Computing, Digital Forensics & Cybersecurity and Georgina Humphries, University Instructor in Computing spent last week in Ireland presenting a course with colleagues from University College Dublin and Norwegian Police University College to Law Enforcement Officers from across the European Union. The course sought to teach investigators how to retrieve digital evidence and gather intelligence using the Python programming language. Funding for the initiative was received from the European Commission and was held under the auspices of the European Cybercrime Training and Education Group (ECTEG) whose activity is coordinated by Europol. This entry was posted in News and tagged ECTEG, EUROPOL, Georgina Humphries, Paul Stephens, University College Dublin on December 9, 2015 by admin. This entry was posted in Misc. and tagged Email signatures, Paul Stephens on July 31, 2015 by admin.